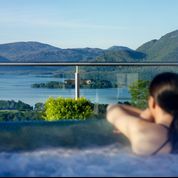 There are many reasons to recommend Aghadoe Heights, but the one thing that always springs to mind whenever this luxury Irish spa hotel comes up in conversation (which is more often than you might think, especially when you’re stuck at home either nursing a cold, or looking outside and wishing you were anywhere else but home) is the intuitive, instinctive skills of the hotel head honchos, Pat and Marie Chawke. Pat and Marie apply skills often overlooked in even the best of hotels – that of genuine understanding of the customer’s requirements, genuine empathy with any complaints (rare, I'd guess, for this hotel), and genuine appreciation of the nice things you might say as you check out. Decent people, however, do not a great hotel make. 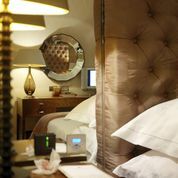 The husband and wife team know this, of course, which is why their demeanour is backed up by some of the best and most subtle style of any hotel in Ireland (or, for that matter, Europe). From the penthouse down (and before we go any further, can we say that the penthouse is totally ab-fab: two en-suite rooms, an outside terrace from which you can enjoy 240-degree views from its hot tub, state-of-the-art audio-visual entertainment, round-the-clock butler service), we can confirm that the rooms and suites are remarkable for their mixture of practicality and far-from-it-we-were-raised luxury. The penthouse is already booked? You are advised not to fret for a second – your own room really is just as cool. 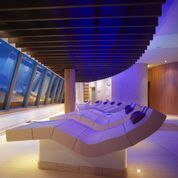 But the Aghadoe is also a destination spa hotel, and here it comes up trumps. Its Aveda Concept Spa is a noted industry leader and is a rarity in that its Zen-like qualities come equipped with the kind of earthiness that makes you feel rooted even while you’re being sublimely prepared for the Hot Stone Massage of a lifetime. Fine dining? You won’t go wanting – the Lake Room Restaurant fuses top-notch traditional service with the kind of cuisine grandma didn’t get around to perfecting. Attention to detail, meanwhile, is terrific, while the comfort factor veers off the chart. In two words? Very special. HOTEL DETAILS: Aghadoe Heights Hotel, Killarney, County Kerry.